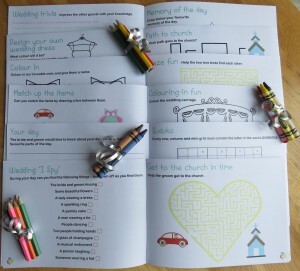 Lemonjelly launches our own wedding activity book for children. The perfect solution to keep your little guests happy! When attending a wedding it can be a long day for a child and they often need to be kept occupied and amused, especially if you would like them to sit quietly through a meal or speeches! Children love to be included and at Lemonjelly we’ve found the best way to do this is through fun and engaging activities. With this in mind, our team of talented childcare professionals have designed our own bespoke collection of wedding activity books for children aged 3yrs to 10yrs, each containing 22 pages of fun activities, colouring, word games, mazes, jokes, puzzles, table games and more! Our activity books can be personalised with the child’s name on the front so they can be used to highlight their seating place at the table. 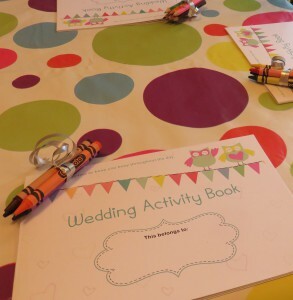 Our wedding activity books are available in 2 age groups; 3 – 5yr olds and 5yrs+ and two size; A5 and A6 and come presented in a cellophane bag. Space on front cover for books to be personalised with your little guests name. 22 pages, including the inside covers (contents varies depending on the age group of the book). Contents includes, colouring pages, drawing, mazes, design your own cake, dot to dots, spot the difference, crossword, match the wedding items, word search, jokes, puzzles, I Spy, Sudoku, wedding trivia and table games. “Memory of the day” keepsake page for the children to draw a picture for the bride and groom. Cover printed on high quality silk white card (A5 version ONLY) with uncoated 100gsm white pages inside. Books are fastened with a staple and come presented in a clear cellophane bag. A5 books measure 14.8 x 21 cm – Perfect for place setting. A6 books measures 10.5 x 14.8 cm – Perfect for gift / party bags.